I am delighted to introduce the first issue of the IRF Advocacy Newsletter, bringing you information and news about the work we are undertaking in the fields of representation and lobbying. This newsletter will come to you henceforth on a regular basis to keep you abreast of IRF Geneva's advocacy activity. Through membership of IRF, your voice can be heard by key governments and institutions. These political instances need to know what your concerns are, as road infrastructure practitioners. In parallel, we will aim to alert you regarding the latest trends and political debates taking place at the levels of the European Union, the United Nations and other key international institutions. In this way, we can help you intervene in timely and efficient manner. We would like to encourage all our members to share with us their views and experiences, as well as issues particularly affecting them, so that we are suitably briefed and armed with all the ammunition we require when talking to political instances. We also warmly invite those who are not yet members to join. By becoming actively involved with IRF, your voice can be heard. 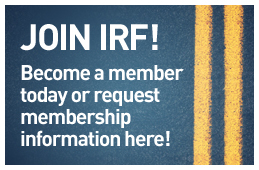 The stronger IRF is in its membership, the better we can represent you. The Prime Minister of Denmark, H.E. Lars Løkke Rasmussen, has convened the IRF and other 200 selected participants to the Global Green Growth Forum, held in Copenhagen on 11-12 October 2011 and inaugurated by UN Secretary-General, Ban Ki-moon. Hosted at POLIS in Brussels on 20th September 2011, the IRF Environment Study Day on “Green Public Procurement & Technology Advancements in the Road Sector” gathered around 50 participants from around the world: Europe, Africa, Australia, New Zealand, India, Russia. Created under the responsibility of the United Nations Climate Change Secretariat (UNFCCC), the goal of this initiative is to raise awareness and catalyze activities developed by the private sector in addressing the impacts of, and vulnerabilities to climate change. The Expert Group on Climate Change impacts and adaptation for international transport networks held its first session on 5 September 2011. 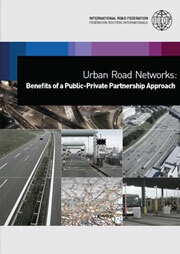 The group is the result of the conclusions reached by the joint UNECE-UNCTAD Workshop on “Climate Change Impacts on International Transport Networks” (September 2010), which had demonstrated the urgent need to prepare appropriate policy actions, as well as the need to exchange information about best practices. At the fringe of the PIARC World Road Congress, IRF Geneva Chairman Mr. Kiran Kapila met with PIARC President Mrs. Anne-Marie Leclerc and reaffirmed ties between the respective organisations. Furthermore, explorative talks have taken place between the PIARC communications committee and IRF to enable and support a wider dissemination of PIARC outputs. In the aftermath of the Mobility in 2030 workshop, organised jointly between IRF and ITS Netherlands/Connect, held on 20 September 2011 in Delft, the Netherlands, representatives of the IRF Policy Committee on Intelligent Transport Systems (ITS) had the opportunity to meet with European Commission's Mr. Pawel Stelmaszczyk, head of the ITS unit within DG MOVE. An unprecedented industry response to the call for experts, encouraged IRF Geneva to launch its new IRF Group of Experts in three different locations. Join now and win two months of membership. 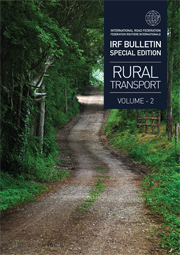 By joining the IRF today, your membership* will run from now to the end of 2012. If you join now, you can already profit from the next IRF Bulletin, the upcoming IRF World Road Statistics and the preferred member registration rate for the IRF International Road Congress on Innovation in Road Infrastructure, held in Moscow from 22 - 24 November 2011. We are happy to welcome Mr. Rohit Chandra-Mouli as the new Membership & Resources Officer. He will help us to strengthen and develop the IRF's membership base and sources of funding. Rohit is originally from India, but has lived in various places across Southern Africa, Switzerland and Canada. Last year, he graduated from the University of British Columbia, in Vancouver, where he completed a BA in Political Science. Rohit looks forward to hearing from you and is at your disposal regarding any queries or concerns you may have. You can contact him at rchandra@irfnet.org. We are happy to welcome Jean-René Berrenger, our new webmaster and IT Manager. He graduated Web Development and worked for a number of international companies such as Netgem® and VideoFutur®. He also spent two years as head of web architecture in a leading software company in Geneva. He is experienced and he is passionate about his work. You can contact Jean-René at jrberrenger@irfnet.org.